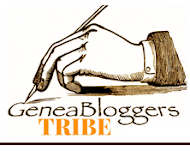 Do other Geneabloggers have a mission statement for their blogs? At the blogging workshop at Mosman Library last week Steven Lewis spoke about the importance of thinking about one's purpose and audience before setting up a blog. This planning could include the writing of a mission statement that could be used as an evaluative tool to keep one on track. What a wakeup call this was! 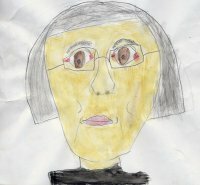 When I had taught writing I always stressed to students the importance of audience and purpose but when I thought about this blog I realised that, as Stephen had suggested, I had identified a niche that no-one else seemed to be blogging about but I hadn't thought much about a potential audience. I'm really not too worried about an audience as I am not writing this blog for commercial gain. If anyone found my snippets interesting/worthwhile then that is a bonus. The power of positive reinforcement from readers does provide a great stimulus to keep posting. My purpose was to create a place where I could share news of resources of relevance to Australian Genealogists, post information about Web 2.0 tools that may be applied to genealogy, have a forum to contribute to Genealogy Carnivals, post short opinion pieces, share my research, help to raise the profile of genealogy in and about Australia and to give Geniaus an online presence. My intention, as an amateur genealogist, is not to write lengthy, scholarly articles but to deliver short and sweet posts. Having written about my purpose I feel that I now have some sort of mission or set of guidelines for my continuing efforts with this blog. My mission is found! Rather than using my real name or a nom-de-plume like John Smith, Carol Jones or Mandy Brown I decided to establish an online identity as Geniaus. Hopefully this short name is relatively unique and identifies me as Australian with an interest in Genealogy. People doing a Google search for Geniaus should find mostly web pages that relate to me or my activities whereas if they used my given names the results would include anyone else blessed with my name. I have registered Geniaus with many free online and social networking sites such as Blogger, Delicious,Picasa, Twitter, Facebook, and Wordpress even though I may rarely use these tools. Unfortunately I am not Geniaus on Youtube! Oh how I wish I could grab that identity. If you wish to check the availability of your favourite online identity Namechk is a useful tool. Genealogists, grab your username on those sites before someone else does. I have also registered the domain www.geniaus.net for my family site. If had had unlimited funds I would register .com, .org etc but I that doesn't fit into the budget. I found this file on my computer. As I don't know where it came from I cannot provide an attribution. Are lost among my socks. How did they spend their days? What about their special times? I’ll never know their ways. Would come to life again. Of the pictures we take today? Someday to be passed away? The strangers in the box. As a family historian I wish that I could unravel some of the stories behind the unnamed, undated photos in our family's photo collection. On 28 May 1815 my convict ancestor Elizabeth Phipps gave birth to a daughter Louisa Westbrook. I can barely imagine what life was like for this mother and daughter in the early days of New South Wales' settlement. On 23 Apr 1832 Louisa married a convict, Charles Clifford, at St Matthews Church in Windsor, NSW. and, in the ensuing 25 years bore him 12 children. I have identified many Clifford cousins on my family website but would love to be in contact with all of Louisa and Charles descendants. In its early days I added content to Wikipedia. One of the things I did, as a teacher, was correct erroneous information that prankster students had added to an entry about their school. After I had corrected the entry I received a message from Wikipedia that the content was being removed because it appeared to be an advertisement. I thought that I had provided facts that were not peppered by the superlatives I was tempted to add. I was th erefore interested to see this recent Commoncraft video for educators that explains how Wikipedia entries are written, updated, verified, and maintained. Thanks to Mr Byrne at Free Technology for Teachers for his post and alert to this video. Unfortunately I can't seem to embed the video in this post but you can watch it here: Wikipedia Video. Although targetted at educators this video would be edifying viewing for family historians interested in reading and contributing to Wikipedia. When attending a genealogy function recently I reflected on the benefits of getting together with like-minded people to discuss a common interest. For the past couple of years I have been reading about genealogy cruises. As I enjoy cruising this type of event where I can do a bit of sightseeing while learning more about my hobby appeals to me. As a user of The Master Genealogist I am attracted to their cruise. It is on a reasonable cruise line, although I am not a fan of huge ships and visits a range of interesting ports in Mexico and Honduras that I have not visited before. The lineup of international speakers is most impressive. Being able to meet with people who are expert in the use of my chosen software would provide wonderful learning opportunities for me. I haven't ruled out a last minute booking for this event , however, it is a long way for someone who has already had one US trip this year. The Legacy Genealogy Cruise 2010 would be my choice if it didn't clash with the predicted birthdate of my next grandchild. I just cannot plan to be out of the country at this time. This cruise leaves my home port of Sydney Australia on November 8th for a 13 day cruise to New Zealand. Once again it is on a huge ship of the Princess line, a line of reasonable quality. New Zealand, a land of stunning landscapes, is a very attractive cruise destination. Although I do not use the Legacy program the program promises to have topics of a general nature and of appeal to those not using the Legacy software. Before I would book this cruise I would like to be able to view the program and list of speakers; unfortunately the Legacy Classes - Schedule & Descriptions page has no details of speakers or topics. The Mennonite Heritage Cruise appeals to me because it visits a part of the world I have not yet explored and on my preference of a small ship. It would be unlikey that, on a cruise devoted to an area and people with whom I have no realtionship, I would learn a lot to apply to my family history reaearch. The 2010 October Mennonite Heritage Cruise will be their sixteenth and last annual cruise. A note on the Rootsmagic site simply states "Please check back later for information about our next cruise." Australian group Unlock the Past have bravely organised for March 2011 a History and Genealogy Cruise of 7 nights cruising the South Pacific. I hope that this is a successful venture for them. As the content of the program for this cruise should have a markedly Australian bias it has much appeal. 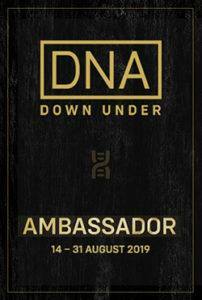 I am concerned that the cruise will only highlight Unlock the Past speakers and be a promotional vehicle for the wares of Gould Genealogy. Hopefully the speakers will be chosen, not just for knowledge in their subject area but also for their communication and presentation skills. I look forward to seeing a call for papers and following that a draft program on the website soon. The cruise leaves the port of Brisbane on the east coast with three island visits. It will be easily accessible by air to Australians on the east coast. I am nervous about travelling on a P&O tourist class ship but if the speakers' program is appealing I will certainly throw caution to the wind and sail away with P&O. It was a real chatterfest at the FindMyPast seminar last Monday evening. While lining up to enter the auditorium I was chatting with some ladies, one of whom mentioned the wonderful resources and fantastic staff at the State Records NSW Office at The Rocks. Two of the other ladies in our group were very interested in this revelation - they did not know about the State Records. I was surprised that anyone researching families in NSW did not know of this organisation, their wonderful online indexes, their searchrooms resources for family historians. As an introduction to their services State Records NSW have produced this video that is available on youtube. The ladies in line the other evening would no doubt find it illuminating viewing. 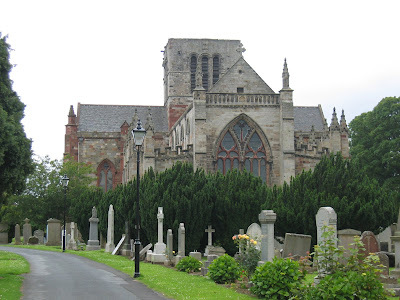 On a genealogy trip to Scotland we went to Haddington in search of my husband's Gowans ancestors. Although we scoured the graveyard at St. Mary's Kirk we were unable to find any trace of them. Whilst in the graveyard we were approached by a Scottish gentleman who was transcribing the site. He gave us his telephone number and said that he would check his records at home for transcriptions. When we telephoned him the next day he gave us the location of a family grave that we were so close to on the previous day. We returned to the cemetery to find a headstone not just with details of my husband's ancestors' burial but with details of a number of other family members. It is pleasing to see that the volunteer gentleman's transcriptions are now available on the Church website. The few youngsters who attended the seminar organised by Unlock the Past at the North Ryde RSL last night were outnumbered by the many enthusiastic seniors at the function. I was pleased to find two retired librarians that I worked with at Waverley Library in the early seventies. The number of enthusiasts at the function , some of whom had travelled quite a distance, indicates that family historians want to hear from speakers with international credentials. Elaine Collins (pictured), from findmypast.co.uk, was the star turn of the evening. She gave an overview of the various product offerings of Bright Solid and a comprehensive tour of the findmypast site that would have been very informative for those not familiar with the product. Speaking to an audience with such a range of skills and knowledge is a tough gig. Elaine was a competent speaker who was able to engage a large and disparate audience. After a presentation by Rosemary Kopittke on Scotland's People Elaine returned to the stage to give an overview of the new find.mypast.com.au and tell of plans for the development of this product that is presently available on a subscription basis for $59.95 per annum. The datasets on this site differ from those on the UK site; there are a number of fulltext documents such as government and police gazettes that can be searched by keyword. Unfortunately for those of us who already subscribe to the full findmypast.uk offering there is not discount for taking up this additional product. In the future consideration will be given to providing a facility to search both product sets at once but this will not be in the short term. 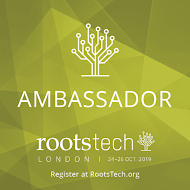 I had hoped to meet some fellow Twitterers and some of my online genealogy pals but they were difficult to find in the crowd. I think that I was the only person Tweeting from the audience! Although the evening could have been seen as a sales pitch for the products of Bright Solid, Gould Genealogy and Unlock the Past it created an opportunity for a large group of people with a shared interest to get together. As I walked in by myself I was immediately befriended by two ladies who graciously invited me to join them for dinner. In the line to enter the auditorium and in the wait for the presentations to begin strangers chatted amicably about their ancestors, brick walls and triumphs in search of their ancestors. I was impressed by the convivial atmosphere of the evening. "The best writing manual is obituaries" was an important message I grabbed at the free blogging workshop held at Mosman Library this evening. In his talk Steven Lewis highlighted the importance of hooking one's readers with a headline that will encourage readers to read on. He compared blog post titles with newspaper headlines that must grab the reader. Steven (aka rule17 ) reminded us that, as with newspaper articles, blog followers may not read the whole post. "Readers won't be with you from headline to fullstop". It is important to lead with the most important content. Obituaries, that have interesting titles are not usually written in a linear fashion, have structures that bloggers can follow. I hadn't thought of this in relation to my genealogy blog but realised that, with those blogs I follow in Google Reader, I probably delete 80% of the posts after reading the post title and first few sentences. So genealogists, if you want to ensure that others fully enjoy the brilliance in your blogs, you will need to get creative with those titles. History of early south western wheat growers wanted. The Rootsweb blog post this week mentions "a fun little video and song from Cadamole, a biologist who sings a song for Mother's Day with a fun scientific twist, including mentions of genealogy! I am not a great fan of genealogy videos but, like Thomas MacEntee's Christmas Song, this song appeals to my quirky sense of humour. Over the weekend three people with family links contacted me as they had found their ancestors listed on my website. "The Ryerson Index is an index to death notices appearing in current Australian newspapers. It also includes some funeral notices, probate notices and obituaries. Because the Index was originally created by the Sydney Dead Persons Society, its strength lies in notices from NSW papers - including in excess of one million notices from the Sydney Morning Herald alone. However, the representation from papers from other states continues to grow, with additional papers being regularly added, so that the Index can now truly be considered an Australian index. Indexing is being continuously carried out by a team of volunteers, too numerous to mention individually, who give freely of their time to ensure the site continues to grow. Site updates occur every couple of weeks, and more often in periods of high activity. The index itself cannot by definition be considered a primary source of data, but is purely a research aid to direct the researcher to the original source of a notice." This newfound cousin was unaware of the existence of the Ryerson Index. Armed with the references I gave her she was heading off to the library to search for more information. Most of my family hail from NSW, an area of good coverage in The Ryerson. I use the index regularly in combination with the NSW Historical BDM indexes,Online Cemetery Indexes, Trove and The Sydney Morning Herald Archive to 1995 (subscription). This potent combination has given me much information on more distant family members for whom I do not wish to invest in BDM certificates from the Registry. An email message received this week with the subject "Back to the scene of the crime" from one of my schoolfriends talked about our recent 40th Wedding Anniversary Party. In a post last week I mentioned that Mr Geniaus and I had tied the knot forty years ago. We returned to the "scene of the crime" for a celebration where we replicated the menu served at our wedding reception. The 2010 interpretation of Minestrone and Chicken Maryland did not resemble to 1970s version at all! Our celebration was held in the same room where our reception was 40 years ago; the flocked wallpaper and crystal wall sconces were gone but the largee crystal chandeliers were still in place. We had a slideshow of photos from our wedding running throughout the night. A number of the original guests who didn't get photos in 1970 have asked me to email photos to them. It seems as we get older that these photographic mementos become more meaningful. I look forward to receiving the photographer's disc of photos from this recent celebration so that I can share them with our guests. In deference to my arthritic ankle we dispensed with the Bridal Waltz in favour of the Anniversary Shuffle. As I couldn't remember what tune we had in 1970 we chose "The more I see you" as the words of this song describe our feelings for each other. I felt sorry for the wonderful band "The Barry Shepherd Quartet" who played during the evening as hardly any of the guests over ten years of age danced; they were so busy talking. Indeed Mr Geniaus and I both lost our voices. 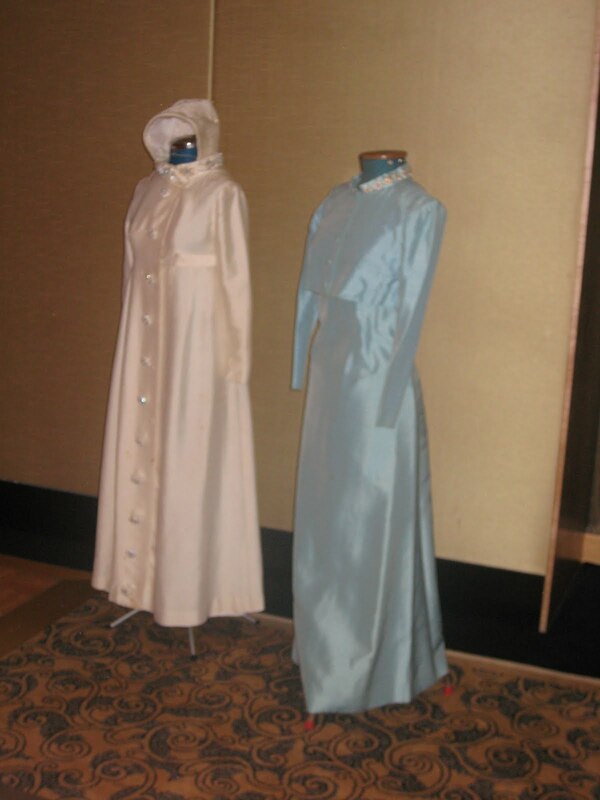 We displayed the brides and bridesmaids dresses on dressmaker's dummies. People asked me if my dress was a coat. 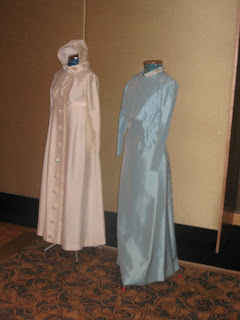 It wasn't - it was just what fashionable and modest young brides wore on cool autumn evenings in 1970 - no goosebumps for us. In 1970 just Mr Geniaus and I stayed at the hotel on the wedding night but last week all 15 of our children, their spouses and our grandchildren joined us. As it was Mother's Day on Sunday we were able to celebrate at breakfast (without the 1970 hangover). We have been inundated with thank you notes,emails and phone calls from those who attended before I have had time yet to send out thank yous to them. It seems as though everyone from our tiny grandchildren to my mother and aunts who are nearing ninety enjoyed the opportunity to get together for an evening of reminiscing and storytelling with old family and friends. Our children enjoyed meeting folk from our past and hearing tales of our youth from longtime friends. I will be saving mementos and photographs of this function in my family history files. With this blog post it should tell future generations a little about our family. This video I came across on Friends of the Earth International has nothing to do with genealogy. However, as I sat down to face another busy week, I thought it was a pertinent message for a Monday morning. John James Ball , who died on this day in 1950, was my husband's great-grandfather. My husband has no recollection of his great-grandfather who came to Australia in 1906 five years before his wife, Emily Royds, to work in the Challenge Woollen Mills in Liverpool, NSW. One wonders why John James came to Australia before his wife when he was living a very comfortable life as the son of a wool merchant in Rochdale, Lancs. Genealogists - is your wireless network secure? Thanks to Chris at one of my favourite blogs SGNE for this news - I'll see if I can track any more Scots' ancestors. Snipped from another library site. Ever felt the urge to find out about your family tree? It seems as though local libraries are promoting the popular pursuit of family history during Library and Information Week 24-30 May 2010 by offering classes and lectures. I have already posted about events at Ballarat and Hurstville and will continue to look for other genie events. Take a look at your library's website to see what other special events are on offer during this week. Mr Geniaus and I are off to a photography workshop at Hornsby Library. ARE YOU A BUDDING FAMILY HISTORY ENTHUSIAST? Hurstville City Library are holding free family history ‘drop in’ sessions. seek advice from LMG staff. databases and resources such as Ancestry Library. Why am I a happy genealogist? A BBC article states "There are positive links between access to technology and feelings of well-being, a study claims". As an amateur family historian who enjoys using a range of techie toys I must say that I concur with the results of the study outlined in this article. My toys have certainly enabled me to keep in touch with family members in farflung areas and to develop a whole web of online genie pals. Explore, Discover, Connect: Family history lessons. Free Family History Lessons in Ballarat and Wendouree to celebrate Library and Information Week. I am thrilled to find Geniaus' blog listed with such sites of distinction. In a former life I was on the international judging panel for the The International Association of School Librarianship (IASL) Concord School Library Web Page Award. Evaluating the various sites nominated was an enjoyable activity. During my career in IT and Libraries I was webmaster for a number of educational websites. As a judge for the Concord Award I was not eligible to have my site nominated for an award. Now semi-retired I still have a passion for online communication and enjoy playing with new applications. 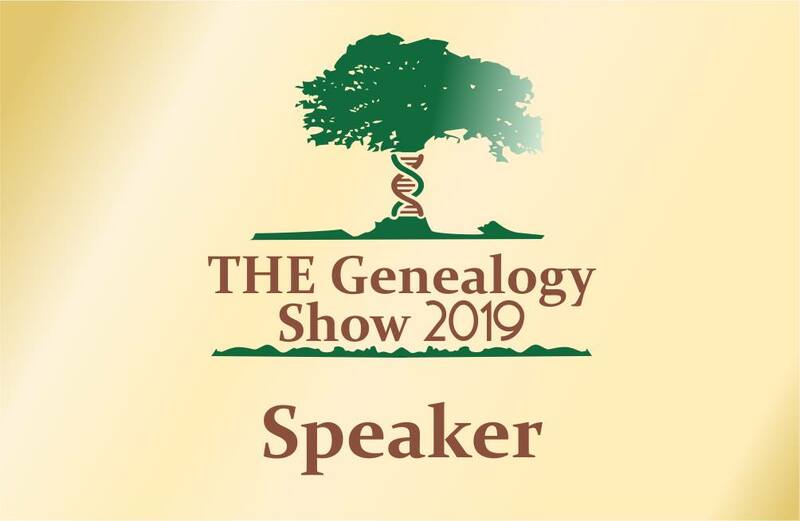 Being able to combine my love of genealogy with my interest in technology and trying to promote genealogy in Australia through my Geniaus blog and Geniaus family site gives me much pleasure. I now understand the excitement experienced by those Teacher-Librarians who won the Concord award. We all like a bit of positive reinforcement. Receiving a listing on the MyHeritage.com list of Top 100 Genealogy Sites will give my little blog exposure to a broader audience. It has provided me with the impetus to work on updating and improving my blog. I just received the latest edition of the newsletter from this library in my area. This excerpt may be of interest to those with family links to the Hills area in Sydney. The Hills Voice Online website has some exciting new stories to tell. Watch a video interview in the ‘Changing Shire’ section about the Castle Hill Water Wall which was officially launched 21 September 2009. It includes images and words reflecting the history of the idea of community in the Hills Shire. Listen to an interview with Richard Green for a Darug perspective on the Hills Shire in the ‘Changing Shire’ section of the website. There is a new interview with Paul Wade OAM and former Socceroo in the ’Community Stories’ section and watch a fascinating Castle Hill House virtual tour and interview with Jonathan Cannon in the ‘Heritage Sites’ section. To find these and and more go to: http://www.thehills.nsw.gov.au/hillsvoices"
Just had an email message from Neil Chippendale, the Local Studies Coordinator, at Hornsby Library. "Our next family history talk is a reprise of the Irish talk. It's on 9th June at 2pm. Jeremy Palmer is again running it. We decided to run it again as we had so many people who missed out." If you are close to Hornsby you may consider this talk. Please contact the Library for bookings. I have not been posting on this blog regularly lately as I have been distracted. I have been organising a party to celebrate more recent family history. 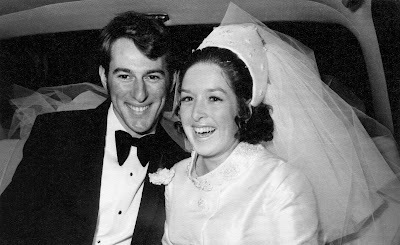 Today, May 8th 2010, Mr Geniaus and I are celebrating 40 years of wedded bliss with a function at the venue at which we celebrated our wedding 40 years ago. Tonight we will be gathering with family and friends to share the same menu and music that we enjoyed in 1970. We look forward to an evening of memories as we think of those who are no longer with us and reflect on the events of the past 40 years. We are thrilled that members of our wedding party are able to join in celebration with us, our children, their spouses and our grandchildren. Mr Geniaus and I have been truly blessed with a beautiful family and a small group of very loyal friends. We look forward to celebrating our good fortune with those who are dear to us. My 3rd Great-grandfather, John Tucker, arrived in Sydney, Australia 185 years ago today. John, the son of William Tucker a butcher from Datchet Bucks. and his wife Mary Eyers, was transported to the colony on Hercules 11. Convicted of Highway Robbery John had been sentenced to death. The Tucker family conducted their business from a shop in The Manor House Range that is still standing in the village of Datchet today. In a blog post a few months ago I told the story of James the Clock, my husband's 3rd great-grandfather. I indicated that we would love to own a clock made by James. Shortly after finding a Gowans clock in Australia at Museum Victoria we discovered that we had missed out on purchasing a Gowans clock on eBay. The clock was not sold on the eBay auction but had been sold by the time we got in contact with the vendor. Although we have our interests listed with many clock vendors in the UK and the US we have not been able to locate a clock since we started looking six years ago. Just last week a gentleman in Scotland contacted our English cousin saying that he has a Gowans clock for sale. Our cousin, who already owns a Gowans clock, immediately contacted us. The clock is a very pretty longcase clock made in the 1850s by James Gowans in Galashiels, Scotland. We are hoping to close the purchase and bring this Gowans clock from Scotland to its family in Australia. I hope to record the clock's journey to Australia on this blog.